The new Alarm.com app for Apple Watch extends the power of Alarm.com from your smartphone to your wrist, creating streamlined new ways to interact with your Smart Home. You can enjoy the benefits of our smartphone app—awareness, instant control of devices, better security, automated energy savings and more—without even taking your phone out. Here are a few everyday situations where Alarm.com for Apple Watch creates a seamless experience where life is safer, smarter and more efficient. The situation: You leave home in the morning. One quick tap on your Alarm.com app arms your security system (and turns down your AC) as you leave. But you forget to close your garage door. As you're on your way to work, you get a light tap on your wrist. It's an actionable notification, powered by our Geo-Services location-based automation, letting you know about the garage. Simply tap the button on the notification to close the door instantly. The situation: you're in a meeting on Friday afternoon when your weekend guest texts you. They arrived early and they're waiting on your porch. With Alarm.com's access control on your wrist, you can discreetly let them in, disarming your security system and unlocking your smart locks. You don't even need to wait until the end of your meeting. The situation: It's Saturday and you're relaxing, binge-watching your favorite TV show. But it's too hot in the house. Another effortless tap on your wrist adjusts your Alarm.com Smart Thermostat to just the right temperature. No need to find your smart phone or walk to the thermostat: you're wearing the controls. You'll find that this becomes a natural way to control other connected devices, like smart lighting. The situation: It's bedtime, and time to secure the house for the night. Thanks to Alarm.com's automation rules, you can secure your whole home for the night with a single action. A tap on your app can arm your security system, which triggers your smart locks to lock, your garage door to close and your outside lights to turn off. It can even trigger your thermostat to turn the temperature down for a more comfortable night's sleep. That's a lot of power in a small package. 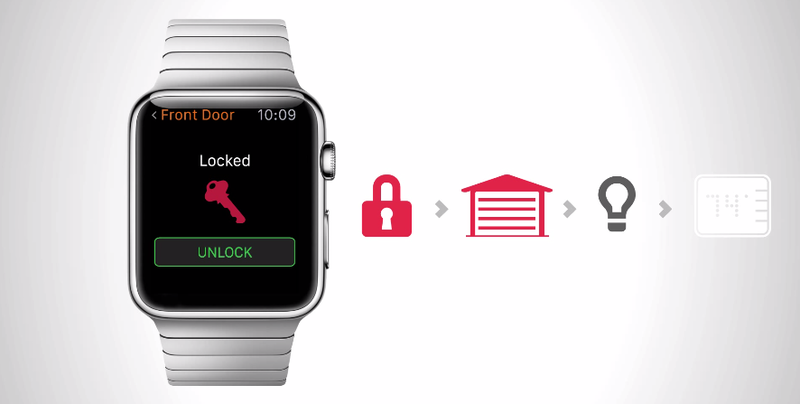 Have you tried the Alarm.com Apple Watch demo yet? Click here to explore the app.